Zucchini Coconut Chocolate Chip Cookies are one of my all-time favorite cookies! They are perfect during the summer months when zucchini is in season, but we make them year round because they are SO good! Is your garden zucchini staring you down? Don’t be scared, we are here to help! Last week we shared a recipe for Grilled Zucchini Nachos and this week we are getting sweet with Zucchini Coconut Chocolate Chip Cookies. I made Zucchini Coconut Bread and fell in love with the zucchini and coconut combo. Since I am obsessed with cookies, I decided to take that wining combo and create a cookie. 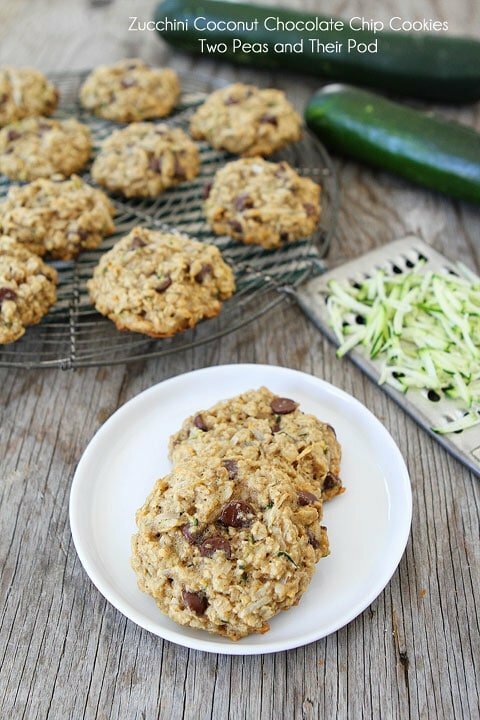 Best decision ever because these zucchini cookies are in my top 10 cookies of ALL TIME! That is a big statement since I have over 200 cookie recipes on our blog, but I LOVE these SO SO much!